Dr. Ken Yasuhara received his Doctorate in Dental Surgery from the University of Southern California School of Dentistry. He has achieved Fellowship status in the Academy of General Dentistry and has advanced training in aesthetic dentistry from the Las Vegas Institute for Advanced Dental Studies. He continues to take over 100 hours of continuing education courses per year. Dr. Yasuhara has the latest in technology. He has the DEXIS Digital x-ray system, the ultrasonic cleaning system for our hygiene department, the Diagnodent for detecting cavities and of course our CEREC technology. Dr. Yasuhara has made a large investment in these technologies to ensure that you have the best that dentistry has to offer. For instance, we only offer composite fillings. We are proud to use MicroDental Laboratories as well as other top labs. We use one of the best implant specialists on the island. We are confident that Dr. Ken Yasuhara is providing the highest standard of care for his patients and is offering the very latest in technology that dentistry has to offer. You can feel confident that you are receiving the very best in care when you come to Dr. Ken Yasuhara. 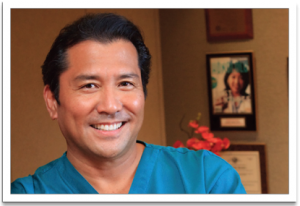 While Dr. Yasuhara offers a full array of general dental techniques, his passion for aesthetic dentistry means he does everything with an eye for both dental health and beauty.